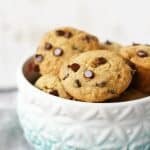 Home » Dairy Free » Chocolate Chip Cookie Mini Muffins. Chocolate Chip Cookie Mini Muffins. 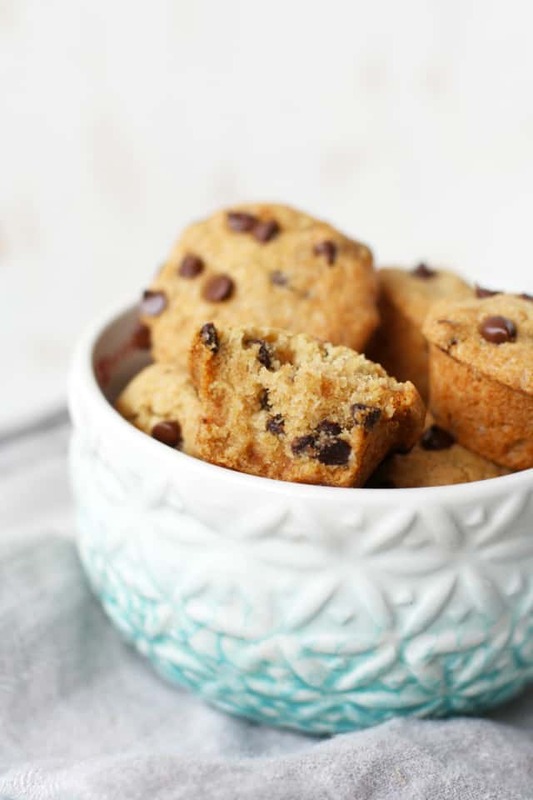 These chocolate chip cookie mini muffins are a fun snack to pack in a school lunch! 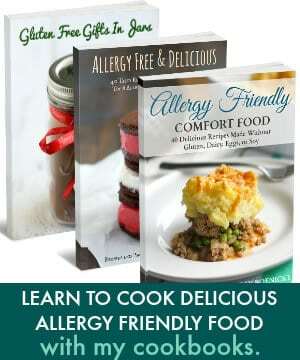 These little treats are gluten free and vegan. When the opportunity arises to bake something, more often than not, my sons request something chocolatey. If they could put chocolate chips in everything, I think they would! 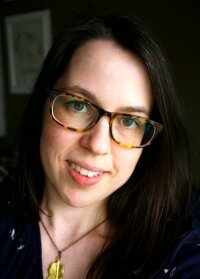 (Who am I kidding, I probably would, too). We love chocolate chip cookies, and chocolate chip pancakes, and we also love these little chocolate chip cookie mini muffins. 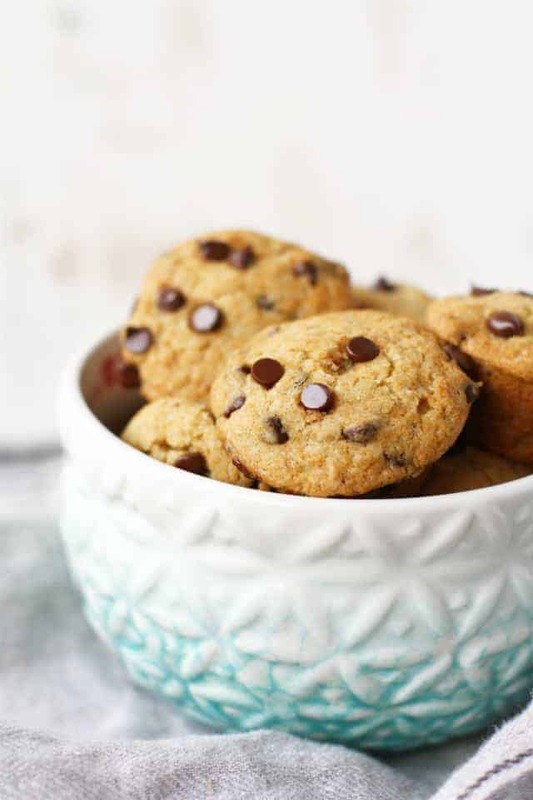 These little treats are a cross between a chocolate chip cookie and a muffin. They’re a fun dessert, and you could even top these with some chocolate frosting or a little scoop of ice cream if you wanted to. These are versatile – they’re perfect for a brunch or breakfast party, or you can dress them up for a birthday celebration. These muffins have the taste of cookies with a cakey, muffin-like texture. They’re delicious warm from the oven, or you can save them in an airtight container and enjoy them for a few days. If you prefer to use all-purpose flour, that will still work. 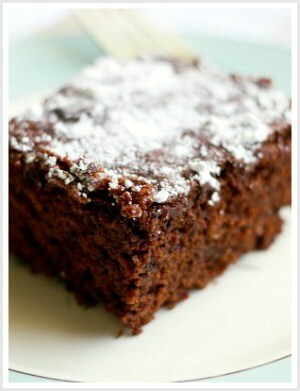 If you aren’t dairy free, you can definitely make these with dairy milk and butter. You can also add dried cranberries or another dried fruit to the batter if you wish. You can freeze these if you aren’t going to eat them right away. Just be sure to use a good freezer bag and remove all the air from the bag before storing these in the freezer. 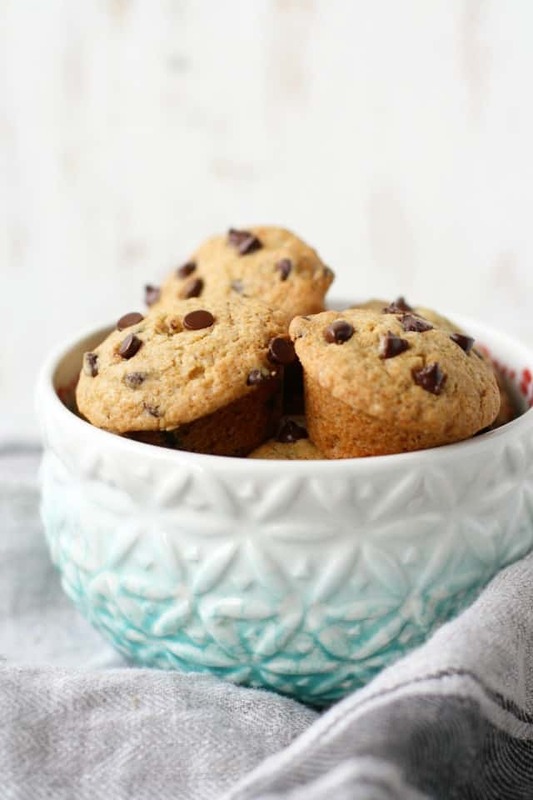 Chocolate chip cookie mini muffins are a delicious gluten free and vegan treat! Preheat the oven to 350 degrees. Grease a muffin tin that can hold 18 muffins. Place the vegan buttery spread, sugars, and vanilla extract in a mixing bowl and beat on medium speed until light and fluffy. Add the applesauce and non-dairy milk and mix to combine. Add the gluten free flour blend, salt, baking soda, and baking powder and mix on low speed, stopping to scrape down the sides of the bowl. Stop the mixer and stir in the dairy free mini chocolate chips. Scoop the dough into the prepared muffin tin. Bake at 350 degrees for about 15 minutes. Let the muffins cool in the pan for about 10 minutes, then invert the pan over a clean surface and tap the bottom to remove the muffins. If you’re looking for another easy dairy free and gluten free treat, try these vegan glazed chocolate donuts. « Gluten Free and Vegan Black Forest Ice Cream. I’m not sure what I did wrong with this recipe. I assume since they are called mini muffins, that a mini muffin pan should be used. Since I don’t have a mini muffin pan I decided to put the batter into however many regular muffin tins that it would fit into. But I ended up with enough batter to fit into 18 regular sized tins. When I baked them They rose in an odd sort of way and then sank horribly. I checked the quantities several times. Any ideas? They did taste great though! Could your baking soda be older? What type of flour did you use? Actually I discovered afterwards that my baking soda was old, but I used it in another recipe without issue. I used Bob’s Red Mill All Purpose Baking mix. Does that mix already include salt and baking powder? No it does not. I am going to try to make these again this week and see how they come out. I must have done something wrong. I was searching for a new chocolate chip recipe to try for Muffin Monday this morning, and came across these. 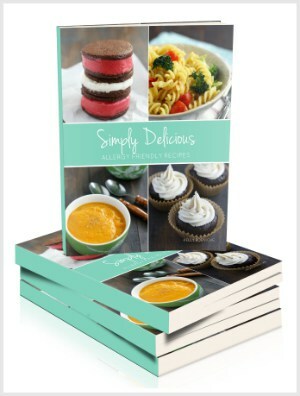 Muffins are a bit of a food obsession for me, so I have tried a lot of recipes. I must say, these are pure perfection. My little boys love the muffins and the fact that they could eat some of the batter! In fact, I am going to freeze some of the leftover batter to put in ice cream. This is definitely going to be my go to chocolate chip muffin recipe from now on. Thank you!! Yay! I’m so happy to hear that! Thank you! Sooooo cute!! I love all things chocolate chip cookie-esque, and muffins are my fave as well, so this hybrid is sheer perfection to me! I’d love to dunk one or seven of these in my morning coffee! I made these today and not only were they delicious but I made chocolate chip cookies with the leftover batter. They came out great! I just baked them in the oven at 350 for 11 minutes. Perfect both ways! Thanks so much for helping all us allergy moms make life just a little sweeter for our little ones!